Burns Night might have passed, but I’ve got one last Scottish recipe that I would like to share. This one is great, as it is both incredibly tasty, very simple to make and really rather healthy given that the main ingredients is the wonderfood that is oats. This dish is called skirlie, and I’ve been making it rather a lot recently. You can more or less make it from cupboard and fridge staples, and the taste is definitely a lot more than the sum of its parts. Skirlie is made from onions that have been browned in butter or olive oil, and then you add some pinhead oatmeal and leave the lot to cook until the oats are slightly toasted. Season to taste. Voila! If you’re trying to imagine the taste, it is something like an onion stuffing (or at least, how a vegetarian might imagine stuffing to taste…). If you’re wondering what pinhead oatmeal is, it is the stuff that looks like little grains of oats, rather than the big, fat flakes. I don’t think there is any reason you could not use rolled oats, but don’t try to use oatmeal or oat flour, as they are too fine. I’ve tried to find out more about skirlie, but this seems to be one of those traditional Scottish dishes that doesn’t really have a lot to say for itself. No links to the Jacobites, no links to Robert the Bruce, and not (as far as I’ve seen) a favourite of Queen Victoria during her visits to Balmoral. This just seems to be a good, honest, traditional recipe, and that’s that! If you’ve got any secret knowledge, please do share! What I was able to find out is that skirlie is traditionally made with beef dripping as the fat to brown the onions, so if that’s your thing, you might want to have a go for a more “authentic” flavour. I think butter works well instead, but of course you can go for a completely vegan option by using olive oil. This really does have the flavour of a very traditional dish, but for its simplicity, it really packs a flavour punch. To make this well, I think there are a few secrets: first, get the onions really cook down slowly until they are nicely browned, which can mean taking the time to get them cook for as long as you can on a very gentle heat. Next, let the oatmeal cook for quite a while, so that you develop some “nuttiness” in there. Finally, get a little creative with the flavours. You’ll need to add some salt, but this also benefits from some black pepper and aromatic herbs. One version I’ve seen uses generous amounts of fresh thyme and lemon zest, which makes this into a very aromatic, fresh-tasting dish. There is, however, one way in which my version of skirlie really veers away from more traditional recipes. All the versions I was able to find told me to add the oats to the onions, and cook the lot, job done. However, I tried this and found the resulting skirlie to be a bit too dry for my liking. This would be fine if you’re serving it alongside something with a lot of sauce, or plan to mix it into mashed potato for some added flavour and crunch, but on its own, I was not convinced. The answer was simple – just add some water at the end of the cooking time, then keep cooking. It will initially boil up and thicken, looking a bit like porridge (at which point you think “oh no, porridge for dinner!”), but keep cooking and it will dry out a bit, but it will turn fluffy and the oats will be slightly tender. 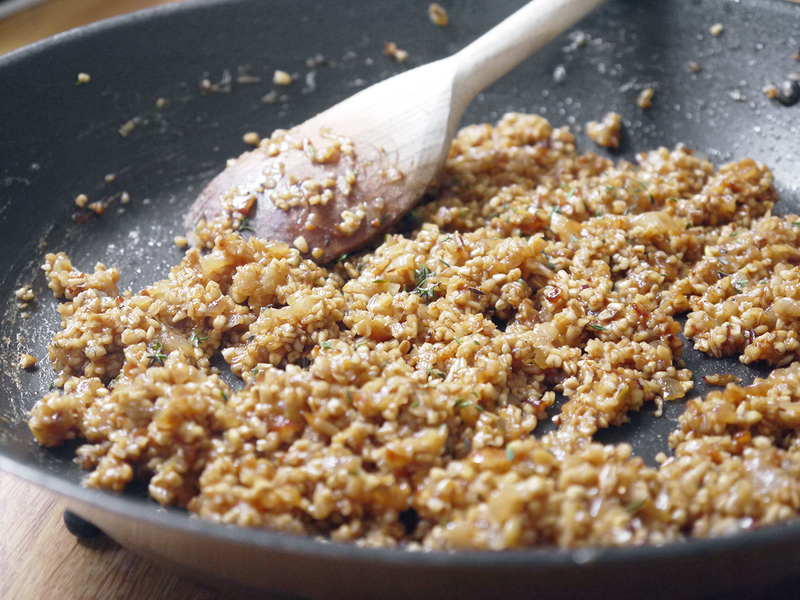 The end result is something with a texture a bit like brown rice. To serve this, I think it really is best as a side dish, to provide a bit of variety from rice or mashed potato (or as I say – mix it into the potato!). You can also add other vegetables, such as mashed carrot or swede, or even some pan-fried spinach or kale for a properly healthy dish. Yes, it contains butter, but all those oats have to be doing you some good! 1. Peel the onions/shallots, and roughly chop. As the oats are fairly fine, you want the onions to add some texture. 2. Put the butter and olive oil in a frying pan. Heat until the butter melts, then add the onions/shallots and fry over a medium heat until they have a good brown colour. 3. Add the pinhead oatmeal and lemon zest, plus herbs, salt and pepper to taste. Cook for around 5 minutes, stirring frequently – the oats should start to brown, but should not burn! 4. Optional. 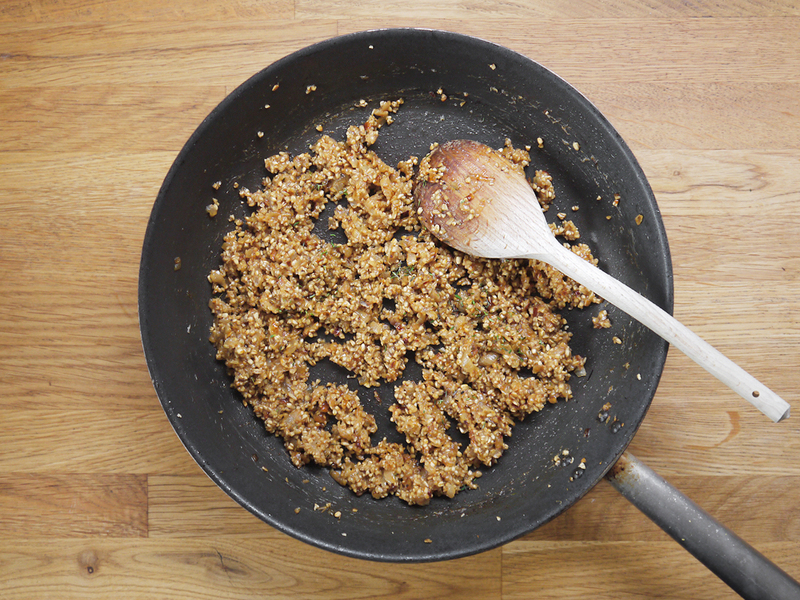 Add some water to the mixture – it will thicken initially, but keep cooking until it starts to look try. Try the oatmeal – if you prefer it to be softer, add more water and keep cooking until you get the desired consistency.